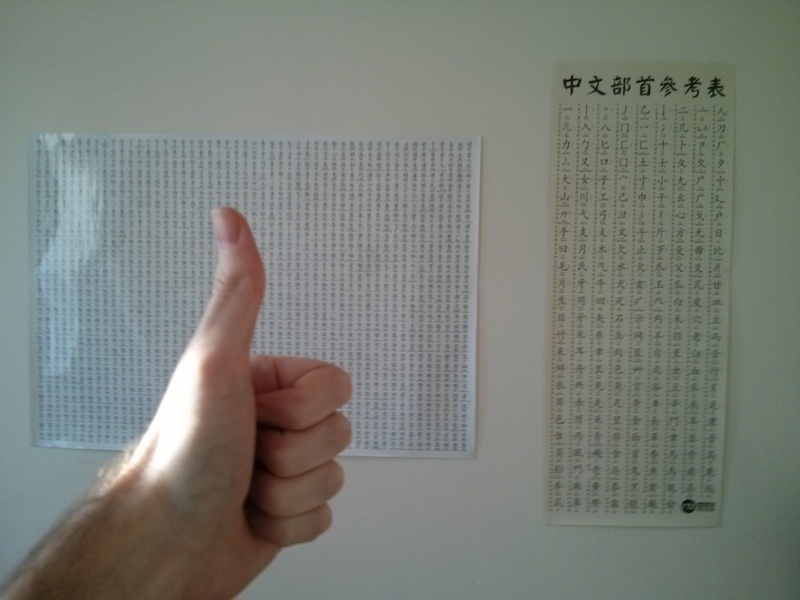 A little while ago I bought some physical Chinese character posters containing the most common Chinese characters and radicals, which I put up on my wall at home. I didn’t really think they’d be much help; it just seemed like it would be cool. They weren’t very expensive so I figured I’d just go for it. The 1,500 most common Chinese characters on the left and the 100 most common radicals on the right. The large poster was laminated and came with a whiteboard marker so that you can circle the characters you’ve already learnt (and erase with ease). It’s not shown in the photo above but I found this to be a great thing to do! It really is satisfying seeing your progress visually up on the wall. If you learn all the characters on the poster, you’re well on your way to fluency (assuming you have the grammatical and composite word knowledge to boot). MandarinPoster.com: Based in Taiwan, this is the one I used and I was very happy with it. They have a nice-looking web site, lots of different kinds of posters to choose from and excellent customer service (all mine happened via their Twitter). The posters were delivered securely in a hard cardboard tube and arrived in perfect condition. If you send them a photo with your poster they will put it in their gallery (see if you can spot mine). HanziWallchart.com: Based in Beijing, I haven’t tried this one but they have also have a lot of poster configurations, with a special focus on HSK vocabulary. They’ve also posted fairly high-resolution images of all their posters to give you a very good idea about what you will be getting. Posters are a good way to measure your progress (helping you stay motivated) and are a great conversation starter, especially when you have Chinese people over! They’re not a replacement for flash cards but are are a nice way to explore the landscape of characters that you will be learning with them. Feel free to comment below if you have any poster recommendations of your own!